Skyline Villas is a beautiful, private foothills community just north of the La Encantada, the open air mall that features Tucson's best dining and shopping. Walk to AJ's! Guests of Skyline Villas enjoy a location where everything is within easy reach including a tennis courts, a sparkling pool and hot tub. The neighboring intersection of Campbell Avenue and Skyline Drive offers entertainment, shops, services and dining options. Skyline Villas offers refashioned open-plan condominiums with resort-style amenities such as a lighted tennis court, a fitness center, and a community BBQ. 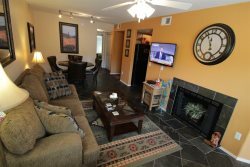 Spacious, bright condos combine comfort, convenience and livable design go along with an inviting clubhouse. Rates are seasonal.